The gorgeous 17 year old Barbados native, Rihanna is enjoying a rapid rise up the US and Australian airplay charts with her first single Pon De Replay. Rihanna's debut album, Music of the Sun promises to have all the ingredients that make musical magic. And like her influences Beyonce, Alicia Keys, and Mariah Carey, Rihanna is a talented songwriter who has co-written much of her album. "Music is in my D.N.A.!" exclaims the bright eyed singer. Her first single Pon De Replay is sure to mash up dancehalls worldwide with Rihanna's soul stirring vocals demanding the DJ to play her song again and again 'til it touches every single person within earshot. With tracks featuring both Elephant Man and Vybz Kartel, Rihanna is guaranteed to supply some serious heat for both radio and clubs nationwide. As Jay Z's newest prodigy, Rihanna is the new princess ofRoc A Fella Records. Not unlike the single, Music of The Sun, is an album of highly addictive and infectious dancehall anthems. There's nothing like the warm spirit of the Caribbean to re-energise a dry, stale season of the same old song and dance. And with summer fast approaching there couldn't be a better time for Barbados-born singer Rihanna to break into an industry that is eager to celebrate the next big thing. Thanks to multi-platinum island-born superstars like Sean Paul, Shaggy and Elephant Man, the mainstream has been primed for a rhythmic female star to step into the forefront of popular music. Besides ripping traditional reggae tracks like a seasoned dancehall queen, the stunning 17-year-old Rihanna possesses a powerful singing voice that conjures up feelings and experiences way beyond her years. It's no wonder that all it took was a quick audition with Shawn "Jay-Z" Carter, President and CEO of Def Jam Recordings, for the green-eyed beauty to solidify a recording contract with the multi-million dollar record company. While that performance ended up changing her life forever, the sweet natured island girl laughs at her own naiveté at the time. "I was in the lobby shaking!," remembers Rihanna with a healthy dose of her Bajan accent hanging onto every one of her words. "I saw just a little bit of Jay's face down the hall and I was just like, 'Oh my God!' I had never met a celebrity, and to meet a celebrity who's also the president of the label, that was crazy!!" Luckily Rihanna was able to shake the jitters as soon as she started her impromptu showcase, a performance that forced her future label bosses to sign the deal before she walked out of their offices. "We were there until 4:30 in the morning closing the deal. Every time I signed my name I was just smiling." Growing up in the parish of St. Michael, Barbados, it never occurred to Rihanna that one day she would be sitting in the company of mega music moguls. 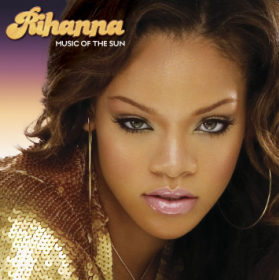 Before moving to the US in 2005, Rihanna lived somewhat of a simple life on her home island where she attended high school and like most teenage girls sang songs for fun with her friends. Aside from winning her school's beauty and talent pageant, Rihanna never realized how talented she really was until she attracted the attention of a New York City music producer named Evan Rogers. (Evan and his partner, Carl Sturken, have produced hits for such artists as Christina Aguilera, Ruben Studdard and Kelly Clarkson.) Evan and his Barbadian wife Jackie were vacationing over Christmas near Rihanna's hometown and through a mutual friend were introduced to the young diva. After hearing her belt out a couple of tunes Evan realized Rihanna's future star power and invited her to New York to record some tracks. Rihanna, Evan and Carl ended up creating close to a dozen songs. Together they pulled inspiration from the dancehall and reggae that are embedded in Rihanna's rich musical culture and fused it with a fresh R&B soul sound - a mixture Rihanna likes to compare to one of her favorite Caribbean dishes, callaloo. "It's like a gumbo or a stew," explains Rihanna. "My music is mostly Caribbean beats mixed with R&B. I don't want to be pigeon holed into being just a dance artist because I can sing too. I have ballads on the album as well as upbeat tracks." Rihanna is indeed living a real life Cinderella story. "If I hadn't met Evan and Carl I might have just been dreaming forever," she muses. "I am so thankful for everything they've done for me." Soon the whole world will be giving both Rihanna and her producers thanks.